Ogden Nature Center - Find something for everyone. Directions: From 1-15, take exit #344 and head east 1.5 mi. Please park in the dirt parking lot and walk along Birdhouse Trail to the Visitor Center to check in. There is only one handicap parking space close to the buildings. All other parking is in the dirt lot. The Ogden Nature Center is a hot-spot for birding in urban Utah. With several ponds and varied habitats, we’ve spotted over 149 species of birds at the Ogden Nature Center. Get the checklist. 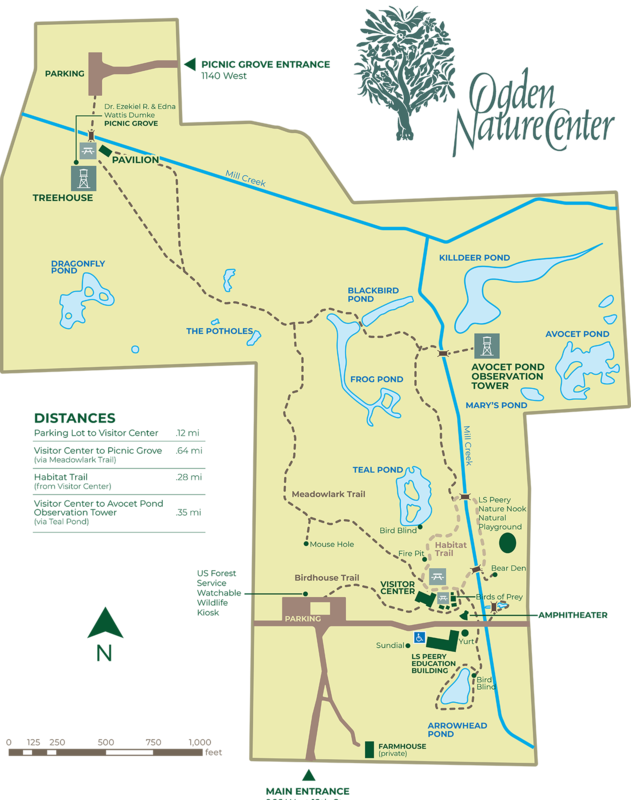 The Ogden Nature Center has over 1.5 miles of easy walking trails and paths. Most are dirt trails, and a few are paved and handicap accessible pathways close to our buildings. Enjoy meeting some of Utah’s native animal species up-close through our live exhibits of birds of prey, snakes, salamanders, tortoises, and spiders. There are often rotating art exhibits in the L.S. Peery Education Center, and some hands-on exhibits in the Visitor Center’s Discovery Room. The Ogden Nature Center hosts some of Ogden’s favorite events, all designed to bring our community closer to nature. From Earth Day in the spring, to Summer Concerts, and Creatures of the Night at Halloween, we have events for all seasons and ages! See what's coming up ahead. Looking for a unique, nature-related gift for yourself or a friend? The Center's gift shop offers a great selection. The Nest carries many items made locally such as Lavender Hills products, soaps, pottery, jewelry and artwork. We also stock a nice collection of nature books for adults and children, notecards, clothings, home decor, fun toys, and eco-friendly items. Some of the most popular items in The Nest are the hand-woven market baskets from Ghana, West Africa and the Folkmanis animal puppets. Watch for seasonal items too! The Nest is located inside the Visitor Center and is open year-round during regular Nature Center hours. Ogden Nature Center members receive 10% off all purchases made in the gift shop. Your purchases support the Ogden Nature Center and its many educational programs. The center has limited paved paths. The rest of the center is leveled dirt trails.